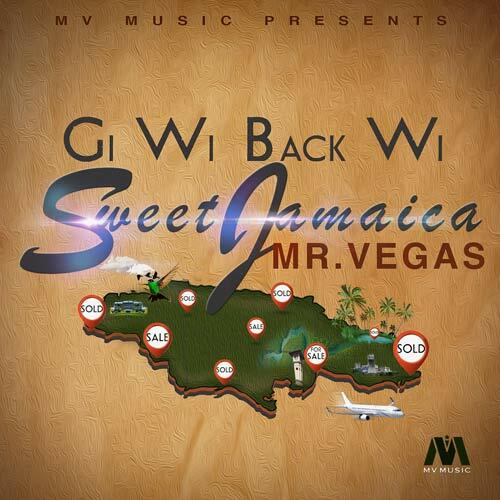 The single 'Gi Wi Back Wi Sweet Jamaica' produced by Mr. Vegas' MV Music label is a mixture of Jamaican original Mento with current dancehall beats. It details aspects of actual Jamaican natural assets being sold to overseas interests. Dunns River, Goat Island and Dolphin cove are just a few examples. Mr Vegas says releasing this single now isn't premeditated; the motivation developed as the issue came to his attention. The single 'Gi Wi Back Wi Sweet Jamaica' would have been done last year or even five years ago if he was made aware of the sale of Jamaican treasures at that time. He also wanted to make it clear this single isn't politically motivated. The song ''Gi Wi Back Wi Sweet Jamaica' is not just for Mr. Vegas' fans, it is for all Jamaicans so they realize what is really going on, that the government is selling our children's future.